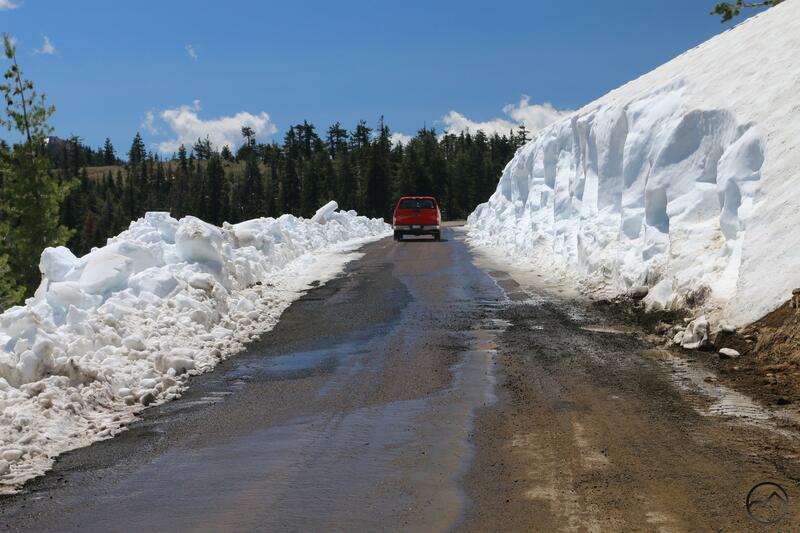 A truck passes through the freshly cleared snow drift at Parks Creek Pass. June is nearly over and the summer hiking season is upon us! Normally, high country hiking would already be well underway but this year, with the massive snowfall we received during winter, things are slower to open up. With the opening of the Old Ski Bowl pushed back to an anticipated date of July 21st, attention necessarily shifts over to the Trinity Divide. 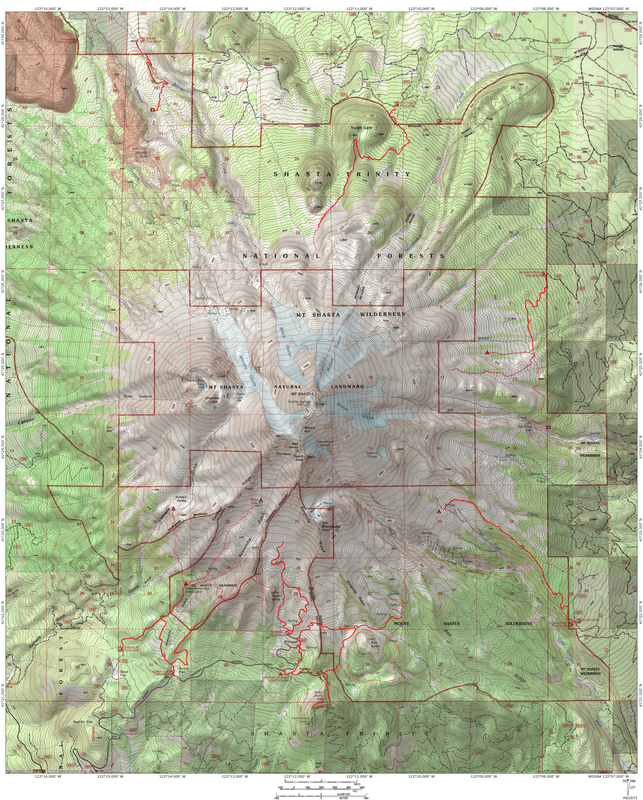 Though there numerous trails in this range, the two critical trailheads are on the Pacific Crest Trail, at Gumboot Saddle and Parks Creek Pass. These trailheads provide access to the PCT as well as other destinations, both in the Trinity Divide and also in the Scott Mountains. While Gumboot was quicker to open up, the traditional large snowdrift at Parks Creek was very persistent this year. Nearly 15 feet high, it posed a serious impediment to getting to the Parks Creek trailhead. However, thanks to the miracle of heavy equipment, the large drift is cleared and the road open. The PCT, as well as direct access to Trinity Alps trails is now available for hiking! Conditions in the high country are gorgeous right now. The grass is green, the creeks full and wildflowers are erupting everywhere. The Parks Creek area is especially lush! If you do head up to Parks Creek, be aware that roadwork is underway and the narrow road can be congested. The Scotts can be seen from Deadfall Meadow. Deadfall Basin is visible from Deadfall Meadow. As noted, Gumboot Saddle and the trailheads along the South Fork of the Sacramento are also open. The snow tends to melt out of this area sooner than on Parks Creek but the rivers and lakes remains full. This area is also particularly beautiful right now! Mount Shasta and the Sacramento River. As an added bonus, the seasonal bridges over the Sacramento River have been installed and the Lake Siskiyou Trail is now complete. The loop is now an excellent option for anyone who wants to get out and hike a surprisingly diverse trail without putting out too much effort. It is also a great running and biking trail. With the way the river has continued to shape the inlet over the last few years, it will be interesting to see if the water can be bridged at the same place in 2018. For now, it is just nice to have a convenient crossing. Enjoy the trails as we head into the 4th of July! Also, don’t forget my newest book will be released on July 1st! I hope everyone will support this site and purchase a copy. It is a spectacular book and really shows off how amazing Northern California is! Thanks for the updates. How’s about hiking conditions on Mt. Shasta? Can we drive up to Panther Meadows? Hike to the Sierra Club cabin? I deleted all your other comments since only one is necessary. To answer all your questions, everything is open except for the road to the Old Ski Bowl. That will likely open up at the end of the month.